Scott Fitzgerald in The Great Gatsby that spoke about the familiar conviction that life was beginning over again with the summer. Life at Kilbeggan Races certainly has that summer atmosphere after the great success of the Midland’s National meeting and the ever popular Best Dressed Ladies Competition. 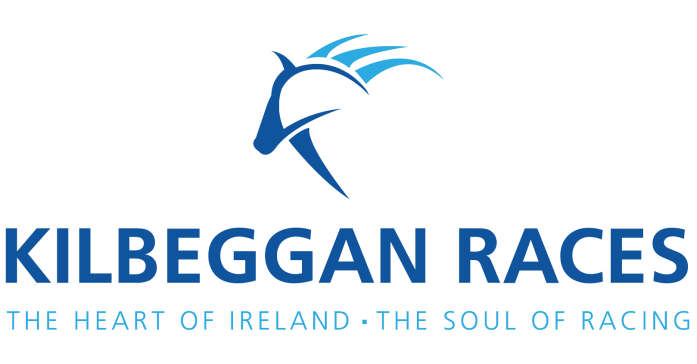 As everybody has that sunny holiday feeling in the first two weeks of August there is no better place to have a party than at the unique Saturday race meeting starting at Kilbeggan at 5.30PM on 12th August. The Best Dressed Ladies competition was won by Ursula Walsh, Tullamore, and it generated great interest, as the crowds gathered for the feature race. The Midlands National was an outstanding success with a big increase in the attendance. The Midland’s National was first run at Kilbeggan in 1997, when Mouse Morris’s Cristy’s Picnic won the race. There was a touch of the Hollywood about that race as well- known Irish Film Director Neil Jordan was one of the owners. It took a piece of ”magic” to win the race, celebrating its 20th anniversary, and it was won by the Tony Martin trained Phil’s Magic. The winner was backed down on the track from 6/1 to 7/2F and beat Mr Bossman (a winner at Kilbeggan in June) by a head in a driving finish. He was a half- brother to The Book Thief, who had twice won in Kilbeggan. The winner had been trained by Sandra Hughes before her retirement and her dad Dessie Hughes had won the race twice. There was a local success when the Richard Cavanagh owned Newsworthy (14/1) beat hot favourite Screaming Rose in the novice chase. The winner was well-named as he was trained by Dot Love, Mullingar and ridden very well by claiming amateur Simon Cavanagh. Willie Mullins had a double with Mystic Theatre (4/11) and Court Artist (7/2). He is leading trainer this season with five winners and his jockey Paul Townsend also has 5 winners. 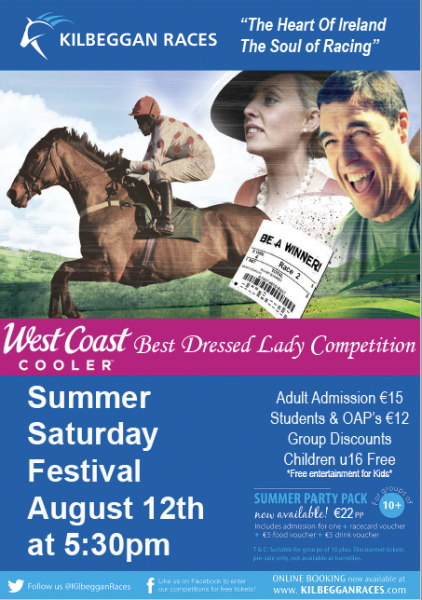 Kilbeggan is delighted to welcome West Coast Cooler on board sponsoring our Best Dressed Lady Competition. The winner will receive two nights’ accommodation and two evening meals in the Luxurious Five Star Merchant Hotel Belfast for two people along with a €1500 voucher for Victoria Square shopping centre Belfast plus VIP front row tickets to Thursday and Friday night of the West Coast Cooler Fashion Week in Belfast. There is also a connection with New York when John Mahon originally from Longford sponsors the Pig N’Whistle Pubs & Restaurant New York Handicap Hurdle of €13,000. The Joe Cooney Memorial Mares Novice Hurdle of €10,500 is being sponsored by the Bank House Family. The original Joe Cooney Cup was first raced for in 1958.It is interesting to note that last year’s leading trainer Gordon Elliott had two winners at the first meeting of the year in April, but surprisingly has had no winners at the last four meetings. He might be worth following next Saturday, as he is due a few winners.